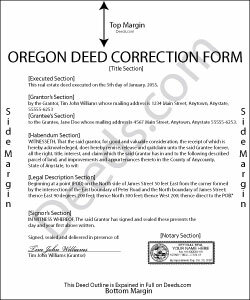 If an instrument is recorded and later found to have missing, incomplete, or incorrect information, Oregon law requires that a statutory statement referencing the prior deed -- called a re-recording certificate -- appear either on the first page of the original document or on an attached cover sheet of a re-recorded instrument (ORS 205.244). The re-recording certificate must identify the person requesting the re-recording, the specific error corrected by the re-recording, and the location where the original deed was recorded (ORS 205.244(2)). If the re-recording certificate appears on a newly generated cover sheet, the cover sheet must meet first-page requirements under ORS 205.234(2), which include the return address, name of transaction, grantor and grantee information, the true and actual consideration for the transfer, and, if applicable, the lien amount and satisfaction. When re-recording a certified copy of a previously recorded instrument, no alterations may be made to correct the document (ORS 205.244(3)). Instead, make the necessary correction on an attachment and include it, along with the unaltered copy and the cover sheet, and identify these attachments on the cover sheet. Oregon does not require reacknowledgement of the deed (ORS 205.244(2)). Contact the local county clerk's office with questions related to re-recording a specific document. Re-record the deed in the same office where the original deed was recorded. This article is provided for informational purposes only and is not a substitute for legal advice. Contact an Oregon lawyer with any questions related to correction deeds and cover sheets. Reply from Staff: Thank you for the kind words Rocio. Have a wonderful day! Terrance S. said: No review provided. Reply from Staff: Thank you Terrance.